With the mission to “push the rock opera music boundaries as far as possible,” Paul O’Neill founded the famous rock opera band Tran-Siberian Orchestra in 1993. True to his word, O’Neill, along with his band members managed to push the boundaries and inspire generations of rock opera fans with around ten million albums sold. Billboard Magazine labeled them as the “top touring band of the decade.” They have been touring excessively for over two decades and the energy found in their concerts is incredible. If you are a rock opera fan, then this winter make sure you check Trans-Siberian Orchestra 2018 schedule. Keep a check on the Trans Siberian Orchestra tickets so that you do not miss out on seeing them live. Tickets for Trans Siberian Orchestra are currently unavailable. This year's tour by Trans-Siberian Orchestra will feature a brand new set design. The set will be designed by a team handpicked by the late Paul O'Neill. 3-TSO will play more than a whopping one hundred shows in sixty fives North American cities. The tour will also feature incredible new effects that will take the entire TSO experience to a whole new level. Trans-Siberian Orchestra donate a part of every ticket they sell to charities. They have till now donated more than fifteen million dollars to various charitable causes. Trans-Siberian Orchestra got into the limelight when they started touring in 1999, after releasing their third rock opera that went by the name of "Beethoven’s Last Night". Eight years later, they were titled as "a touring juggernaut" by The Washington Post. As was the dream of O’Neill when he formed the band, they were also compared to the famous names of the rock music history such as The Who and Pink Floyd. The band’s musical style comprises of merging of several rock genres such as orchestral, classical and symphonic. They combine elements of heavy metal and hard rock as well. Trans-Siberian Orchestra has brought to the fans rock operas series consisting of "Christmas Eve and Other Stories", "Beethoven’s Last Night" and "The Lost Christmas Eve". The Lost Christmas Eve was the last in the trilogy and was released in October of 2004. The album was certified Gold in first two months and later multi-platinum. The first in the series, ‘Christmas Eve and Other Stories’ was released in 1996, and is till day the band’s bestselling album. The sequel to this album was released by the name of "The Christmas Attic" two years later. Trans-Siberian Orchestra’s "Beethoven’s Last Night" hit the shelves in 2000. Although it was recorded before The Christmas Attic, the band decided to hand it over to Atlantic Records for releasing in 1999. This rock opera revolves around the life of the famous musician Beethoven. The songs are full of twists in the tale and have kept the audiences mesmerized over the years. In 2012, its "Beethoven’s Last Night: The Complete Narrated Version" was released as well. This was followed by yet another session of excessive touring. Trans-Siberian Orchestra released "The Christmas Trilogy", the compilation of the three rock operas in 2004. This was followed by years of touring. Band’s fifth album "Night Castle" finally came out in October of 2009 and received rave reviews from both the critics and the fans. The album debuted at number five spot on Billboard. In two months it was certified Gold by RIAA. It was titled as their "most ambitious" as well as their most "adventurous" work till day. Like all of their previous operas, this one was based on an intriguingly unique story as well. Trans-Siberian Orchestra’s "Dream of Fireflies" hit the market in October of 2012. It was an EP made up of five brand new songs by the band. The album got ninth spot in Top 200 Albums chart in Billboard Magazine. Unlike their previous albums based on lengthy stories, this album was more of a short story cluttered inside five songs. The band released its fifteen track new collection album by the name of "Tales of Winter: Selections from the TSO Rock Operas" in October of 2013. This included songs from all of the albums released in the past. The release was followed by the start of yet another tour which took the band all across North America. You can be a part of their upcoming concerts as well, as the TSO tickets are available online. The Trans-Siberian Orchestra then came out with "Letters from the Labyrinth" in November of 2015 and it climbed to number seven on the Billboard 200 while going to top the Billboard Top Rock Albums. It was unfortunately the last album that TSO released before David Z and Paul O'Neill passed away. With the mission to “push the rock opera music boundaries as far as possible,” Paul O’Neil founded the famous rock opera band Tran-Siberian Orchestra in 1993. True to his word, O’Neil, along with his band members has managed to push the boundaries and inspire generations of rock opera fans with around seven million albums sold. Recently, Billboard Magazine labeled them as the “top touring band of the decade”. They have been touring excessively for the past fifteen years, and the energy found in their concerts is incredible. If you are a rock opera fan, then this winter make sure you attend Trans-Siberian Orchestra’s live concert when they arrive in your city. Keep a check on the Trans-Siberian Orchestra tickets. Paul O’Neil breathed his last on April 5, 2017 and the acclaimed orchestra has announced a tribute tour for him. A Trans Siberian Experience – Trans-Siberian Orchestra Tribute will honor the musical proficiency of the composer, songwriter and producer. The winter tour 2017 will be a tribute to O’Neil’s genius. Also on the schedule is Christmas Dreams Forgotten – A Tribute to Trans-Siberian Orchestra. A brand new event, it will stop in select locations in North America. Fans can also buy tickets to Ornament – Trans-Siberian Orchestra Tribute show, a super energetic musical presentation of classic holiday songs and carols. Get into the holiday spirit this season by attending performance by the Trans-Siberian Orchestra. In August of 2017, Trans-Siberian Orchestra announced its winter 2017 tour amongst speculation about the future of the act. Guitarist Al Pitrelli put these rumors to rest by announcing that the band will embark on a tour to celebrate the contributions and accomplishments of their late creator/composer Paul O’ Neill. The band is coming up with new pyrotechnics this year in order to present a fitting, grandiose tribute to their career-defining leader. TSO’s much anticipated The Ghosts of Christmas Eve is set to begin on November 16. It will visit over sixty cities and put together more than a hundred performances before wrapping up on December 30. If you have been looking for an answer to the question; Is Trans-Siberian Orchestra touring in 2018? Then the answer is yes! TSO announces 2018 winter tour! This year's trek will however be bigger and better which is why fans are buying Trans-Siberian Orchestra tickets 2018 in even bigger numbers. The sensational Trans-Siberian Orchestra is celebrating its 20 year anniversary of touring this year with a winter tour that will blow you away. Fans are buying Trans-Siberian Orchestra tickets in big numbers once again this year. A TSO tour has become an annual holiday season staple and their shows are always all sold-out events. It is not expected to be any different this year either. The stage is set for them to take their fans for a ride that they will not forget for a long time. If you want to join them, then go through the Trans-Siberian Orchestra 2018 tour schedule and go through the Trans-Siberian Orchestra 2018 tour dates in detail. Book your tickets and be a part of the TSO tour 2018. With trans siberian orchestra promo code "HOLIDAYS2017", you can now get a 4% discount on tickets. Nothing beats the joy of watching your favorite music artist perform live! Trans Siberian Orchestra's concert dates are out and fans are looking forward to the upcoming shows. The first Trans-Siberian Orchestra holiday concert will be held in Green Bay at the Resch Center on November 14, 2018, while the last available date is for the event scheduled for Milwaukee at the Fiserv Forum on December 30, 2018. For complete information regarding dates and venues, please visit our website. Trans-Siberian Orchestra announces 2018 winter tour! This year's trek will however be bigger and better. The sensational Trans-Siberian Orchestra is celebrating 20 year anniversary of touring this year with a winter tour that will blow you away. Fans are buying Trans-Siberian Orchestra tickets in big numbers once again this year. A TSO tour has become an annual holiday season staple and their shows are all sold-out. It is not expected to be any different this year either. The stage is set for them to take their fans for a ride they will not forget in a hurry. The average price for Trans Siberian Orchestra Tickets start from $100. The minimum get in price is $16 for Trans Siberian Orchestra Tickets at the Quicken Loans Arena, Cleveland. For a detailed look at ticket prices and amazing discounts, visit our website. When will you send me my cheap tickets to trans siberian orchestra tickets? Is the online purchase of trans siberian orchestra discount tickets safe? I am looking fort Cheap Tickets For Trans Siberian Orchestra. Can you help me? Do i have to be a member to get trans siberian orchestra discount code? I wish to buy trans siberian orchestra tickets but i can't pay in advance. Q:How long does the Trans Siberian Orchestra concert last? A:Trans-Siberian Orchestra concert usually lasts for around three hours. This includes a sort introduction of the band and the singers between the two parts of the show. The first part features a story while the second part includes live performances of songs from their latest albums. Q:Is there any way I can get Trans Siberian orchestra November 23 tickets for free? A:Sorry but you will not find Trans Siberian Orchestra Tickets for free on our website. However, the amazing deals offered by our brokers are such that they would not put strain on your pocket. Also discount codes on our tickets are put on our Facebook page from time to time. So if you are looking for further discounted rates, keep a look on our Facebook page as well. Q:Where can I get more information on TSO concert tickets? A:For all information on Trans Siberian Orchestra Tickets, please visit the relevant event page. There you will have access to the details including the date, time, venue as well as the seating chart etc. If you require additional information you can also visit the TSO's official website. Q:Will there be any hidden charges if I buy my TSO 2018 tickets from your website? A:Rest assured that there will be no hidden charges on your purchase of Trans Siberian Orchestra Tickets from our website. You will have to pay the mentioned amount only and nothing above that. Q:What is the price of Trans Siberian Orchestra tickets for the events in Denver? A:As of now the average price of Trans Siberian Orchestra tickets for both the events in Denver is $258. The get in price of these tickets currently stands at $35 and $17 for the November 17 and 18 shows respectively. Please note that these prices are subject to change. Q:I want to purchase Trans Siberian Orchestra 2018 tour tickets. How can I pay for them? A:Trans Siberian Orchestra Tickets are available on our website at best prices. You can purchase these by paying our brokers through a valid credit card. The transaction process is easy and you need not worry about any kind of fraud. Please note that it is against our policy to accept cash payment. Q:Are you selling trans siberian orchestra tickets 2018? A:Yes Trans Siberian Orchestra tickets are being offered by our registered brokers on our website at affordable prices. You can check out the seating chart and price of tickets by visiting the relevant event page. The tickets are 100% authentic and the purchasing process is simple and transparent. Q:Where is the Trans Siberian Orchestra playing? A:Formed by Paul O'Neill, Trans-Siberian Orchestra is famously known for their live performances. They have sold more than ten million concert tickets so far. The band is on tour as of now and will be playing their concerts in cities including Oakland, Sacramento, Toledo, Ontario, Glendale, Lubbock, Greensboro and Birmingham. Trans-Siberian Orchestra plans to end their trek by performing its last gig in Saint Paul on December 30, 2017. Q:When do tickets go on sale for trans siberian orchestra? A:The Trans Siberian Orchestra Tickets go on sale as soon as the event is announced. Kindly visit our website and go to the events page to keep yourself updated. The brokers will offer the tickets in a range of prices so, select the one that suits you and place your order to watch the group perform live. Q:How will you deliver tso tickets winter tour if I buy them? A:Your Trans Siberian Orchestra Tickets will be delivered to you via FedEx, which is one of the best courier companies in the world. Orders are placed as soon as we get them and you can rest assured that your tickets will be delivered to you well within time for the event. Q:Will I be able to have my trans-siberian orchestra december 2 tickets refunded? A:You can have your Trans Siberian Orchestra Tickets refunded but only in case of very special circumstances. Please note that even then the refund will be given according to the terms and conditions mentioned in the "policies" page on our website. Q:Why do the prices of trans siberian orchestra cincinnati tickets vary so much? A:The prices of Trans Siberian Orchestra Tickets, just like other event tickets, vary depending on two major factors; the nature of tickets and the placement of seats in the venue. The nature of tickets refers to whether they are special or regular tickets. Special tickets, like VIP tickets, are usually priced higher than regular tickets, because they guarantee the holder special treatment at the event. The other factor effecting ticket prices is the placement of seats in the venue. Seats located close to the main stage of a venue are usually priced higher and the price decreases as you move further away from the stage. Since there are numerous seats in the venue, there is a large variation in ticket prices. Q:How to get cheap tickets for the trans siberian orchestra? A:Our website is a good source to purchase Trans Siberian Orchestra Tickets at affordable rates. Enjoy! Q:When can i get cheap tickets to trans siberian orchestra concert? A:Anybody can get discounted Trans Siberian Orchestra Tickets instantly by using the promo codes on our page. Get them as soon as possible. Q:Can i get cheapest tickets for trans siberian orchestra from you? A:We don't promise cheapest Trans Siberian Orchestra Tickets but are offering them on reasonable rates. Use the promo codes and get them right away. Q:When will you send me my cheap tickets to trans siberian orchestra tickets? A:Your Trans Siberian Orchestra Tickets will be shipped to you as soon as your payment is processed with us and it usually takes 1 business day. Q:How many cheap transiberian orchestra tickets do you have? A:Trans Siberian Orchestra Tickets are available with us in an ample quantity. You can get them from us whenever you want. Q:What if cheap transiberian orchestra tickets dec 15 I ordered are no longer available with you? A:If the Trans Siberian Orchestra Tickets you ordered are no longer available with us, we will provide you with similar seating. Q:I have already ordered cheap tickets to the trans siberian orchestra, can I make changes to the tickets order? A:Sorry you cannot make any changes to the Trans Siberian Orchestra Tickets order. Q:I have got some discount tickets tso using the promo codes. Can I use the same discount codes for other tickets? A:You can use the same discount codes on the Trans Siberian Orchestra Tickets as well as all other tickets on our website. Q:Do you sell cheapest trans siberian orchestra tickets here on your website? A:We have Trans Siberian Orchestra Tickets available at some really affordable rates and also at discounts. Look through our page for details and order from there. Q:Can i buy tickets to trans siberian orchestra by cash? A:You can only buy Trans Siberian Orchestra Tickets by American Express, Visa, Master Card and Discover. Q:I lost discount tickets trans siberian. Can i get them again on the same rates? A:Yes, the discount offer is still active on Trans Siberian Orchestra Tickets. Check out the directions and place the order as early as possible. Q:Is it possible to get trans siberian orchestra promotional code now? A:Yes, just follow the instructions on our page and place the order for Trans Siberian Orchestra Tickets right away. Q:Where can i find the cheapest trans siberian orchestra tickets? A:We are offering Trans Siberian Orchestra Tickets on cheap rates online. Follow simple directions and use the discount codes to enjoy cheap rates. Q:Can i still get trans siberian orchestra no fees tickets? A:Yes, the no fees offer still stands for Trans Siberian Orchestra Tickets. Get them as soon as possible. Q:When will promotion codes trans siberian orchestra tickets get activated? A:The discount policy on Trans Siberian Orchestra Tickets is active already. Get them as soon as you can. Q:When will my credit card be charged for transiberian orchestra tickets? A:Your credit card will be charged for Trans Siberian Orchestra Tickets as soon as the deal is final. In case there is a delay, it would not exceed one business day. Q:Till when are you offering tran siberian orchestra tickets discounts? A:Discounts on Trans Siberian Orchestra Tickets are being offered till the date of the event. Check out the instructions and place the order right away. Q:From where can i get details on tran siberian orchestra ticket prices? A:The price details of Trans Siberian Orchestra Tickets are published on our page. Check it out online and order right away. 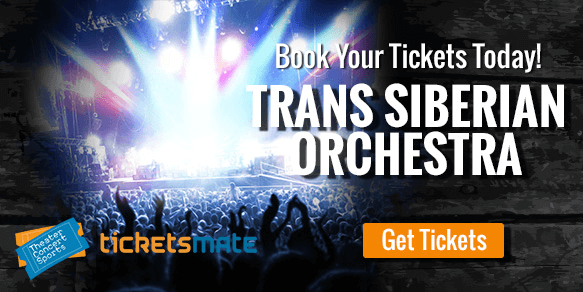 Q:Are trans syberian orchestra tickets on sale? A:Yes, Trans Siberian Orchestra Tickets are on sale already and that too with discounted rates! Get them as soon as you can! Q:Is the online purchase of trans siberian orchestra discount tickets safe? A:Yes, we are certified by trusted authorities and allow the exchange of Trans Siberian Orchestra Tickets in a secure environment. Q:At what price are you offering trans siberian orchestra discount ticket? A:We are offering Trans Siberian Orchestra Tickets on comparatively cheap rates with special offer codes. Check the price details on our page and place the order. Q:Can i exchange my tran siberian orchestra tickets for another date? A:No, according to the company policy, we cannot exchange your Trans Siberian Orchestra Tickets. Sales once made are considered to be final. Q:How will you dleiver my transsiberian orchestra tickets? A:Your trans siberian orchestra Tickets will be delivered by FedEx. Q:I am looking fort Cheap Tickets For Trans Siberian Orchestra. Can you help me? A:Use the discount codes of trans siberian orchestra Tickets available on our page and enjoy them on cheap rates. Q:How do i use the trans siberian orchestra promotion codes? A:When you buy the trans siberian orchestra Tickets, use the code at the checkout page. Q:Are there any delivery charges for siberian orchestra tickets? A:Delivery charges for trans siberian orchestra Tickets are included in their prices published online. There is no extra cost. Q:How do I get trans siberian orchestra tickets? A:You can take your pick from Trans Siberian Orchestra Tickets page. Q:Are you offering any trans siberian orchestra tickets discounts? A:Check with our live help service for the latest on Trans Siberian Orchestra Tickets discount. Q:I am looking for cheap trans siberian orchestra tickets. A:You will find the Trans Siberian Orchestra Tickets at good rates at our website ! Q:Do i have to be a member to get trans siberian orchestra discount code? A:No, our site doesn't require any membership. Trans Siberian Orchestra tickets discount codes are available for everyone. You can get them from our live operators. Q:How will my discounted trans siberian orchestra tickets be delivered to me? A:Your Trans Siberian Orchestra tickets will be delivered toyou through FedEx. They can also be collected from the venue but only if you chose that option. Q:My granny need to attend Trans Siberian Orchestra with us, she is on wheel chair. Do you have tickets for special guests? A:Please calll the venue and ask them about the section reserved for special guests. Later you can find Trans Siberian Orchestra tickets in that section. Q:I wish to buy trans siberian orchestra tickets but i can't pay in advance. A:With out getting the payment for Trans Siberian Orchestra tickets, the broker will not process you order. Q:Do i need to mention in my order that i need 8 trans siberian orchestra tickets side by side? A:You can get upto 4 Trans Siberian Orchestra tickets side by side, call us at (888) 856-7811 to discuss you options.